If Sister Act taught us anything, it's that even the coldest, most stoic nuns aren't immune to the temptations of a good time, and that a lifelong dedication to God can hardly match the power of a charismatic Whoopi Goldberg. And sure, that was a '90s fictional musical comedy, but it holds true that real-life nuns are absolutely susceptible to human temptation, at least judging by a pair of 'em in California that are being accused of embezzling half a million bucks from a Catholic school to help fund their gambling trips to Las Vegas. Sisters Mary Margaret Kreuper and Lana Chang, a former principal and longtime teacher at St. James Catholic School in Torrance, California, stand accused of stealing roughly $500,000 from the school and using it to go on trips, including casino getaways to Las Vegas, according to the Long Beach Press-Telegram. Their alleged scheme came to light recently after staffers realized a check that had been made out to the school years ago had actually been deposited into a different bank account, which the two women had evidently used as a travel and gambling slush fund. “We do know that they had a pattern of going on trips, we do know they had a pattern of going to casinos, and the reality is, they used the account as their personal account,” the school's attorney, Marge Graf, explained during the meeting, per the Beach Reporter. 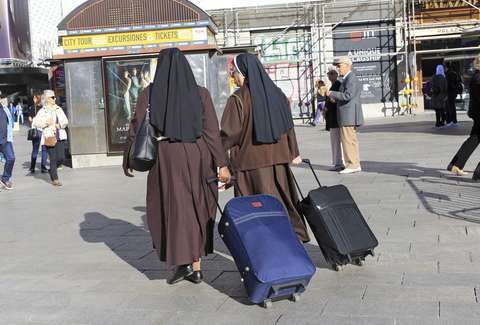 Parents apparently knew of the nuns' frequent trips, though the two women claimed they were actually gifts from a rich relative. A convenient excuse, considering nuns take vows of poverty. When the school officials figured out what was going on, they confronted the nuns, who promptly admitted to the fraud, and have since begged forgiveness from the community. However, the order the nuns belong to has agreed to pay it all back, and because of that the archdiocese is not pressing charges. And while the nuns' order says it will impose "severe sanctions" against them, it's still unclear whether the two will face any legal action.